Nope, the little one seems very, very comfy. 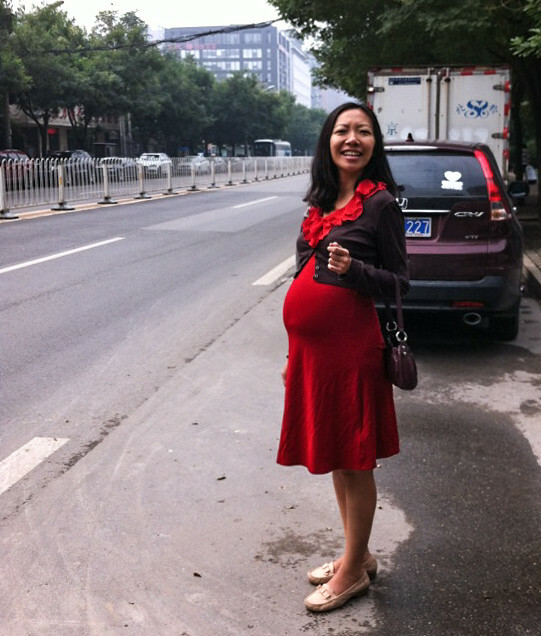 wonderful photo of shanshan and the baby! beautiful and proud in that red dress! Dear Robert and Shanshan Please know that Patti and I are thinking of both, no, make that “the three” of you and sending tons of love. Shanshan — have a magnificent delivery!! Yep, she later explained that the baby was in the right position. We’re still looking for 2013-10-01, give or take a week. there is a lot of excitement over here as we await the good news. so interesting how long mothers stay in the hospital there…here, as you know, it is a fast turnaround. i hope shanshan can sleep all right with so many women in the room. then again, it is also wonderful to share with other women who have just had a baby. Thanks. She did well the last time she was there. It was in old wing. She spent more days there, and with eight women in the room. They do build some sort of comradery.